I love to find puzzle game apps for kids. Games that sneak a little learning into kids’ lives are a wonderful idea. It’s also great to find apps that can be used productively in an educational setting. 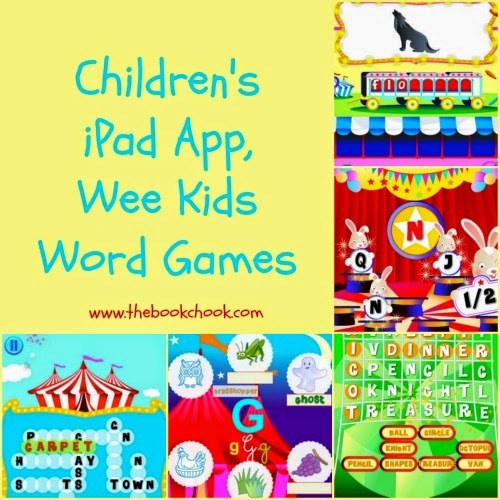 Wee Kids Word Games could be useful for children 5+. Play with circus performers, increase your language and spelling skills by moving between letters and words with colored graphics. It’s fun and most of all filled with innovative and intriguing games. You will try and “Catch the letters!” by racing the quick bunnies. Practice searching for words in the trapeze nets. View all the letters of the alphabet and select your favorite images to help associate and remember the letters. What I liked: It’s handy that there is a range of difficulty in this app. In families and classrooms, that means children can play the game that suits their level of ability. The app is engaging, with bright primary colours and a circus theme. There are no in-app purchases. I liked the games too - from simple letter matching and recognition, memory games, find-a-words, through to more difficult spelling games and “crosswords”. Music is cheerful without being annoying. I was a little puzzled by the way print was represented in the app. There’s a mix of upper case, lower case and a script that has lots of curly bits. For instance, in one of the games, the upper case letters at the start of words aren’t much taller than the lower case letters. And the children in Australian schools would be unlikely to recognise the scripted X. Having said that though, kids are amazing in their resilience and ability to cope with differences, and I think most kids will work out what’s going on. In the more difficult games, upper case letters are used and that’s a convention children need to recognise. Today is International Literacy Day - great day to play some word games with your kids! Check out my other iPad App Reviews on Pinterest.